Earlier this month we at Gaadikey.com had reported that Bajaj has confirmed that it would bring the Husqvarna brand in India next year by launching two motorcycles – the Svartpilen 401 and the Vitpilen 401 – from the Swedish two-wheeler manufacturer. Previously, the company had also held a clinic in Pune for existing KTM owners, where they could test ride both the motorcycles and give their feedback. 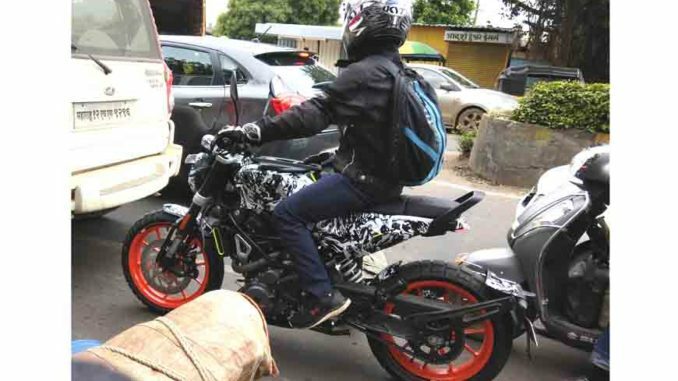 Now, a Husqvarna Svartpilen 401 prototype has been spotted testing around Pune, New spy shots suggest India could get slightly modified versions of the upcoming Husqvarna 401 models. While the international-spec Svartpilen 401 rides on spoke wheels, the camouflaged motorcycle caught testing was seen running on alloy wheels sourced from the KTM 390 Duke. However, the test mule was running on the same Pirelli Scorpion Rally STR enduro tires from the international Svartpilen, as opposed to the Metzeler Sportec M5 as seen on the KTM. Additionally, this test mule had KTM branding on the engine cases, which shouldn’t come as a surprise as Bajaj is probably in the midst of streamlining the production switch for the small Huskies from Austria to India (the 401s share their motor with the 390 KTMs). Husqvarna previously announced that production of the 401s will shift to India by late 2018 for export, and the test mule is likely to be an early made-in-India prototype undergoing testing for quality and other parameters. Bajaj is making significant changes to a KTM or Husqvarna product for our market. Of course, it remains to be seen whether the final bike comes in this spec. If it does, it might set a precedent for future products, including the highly anticipated KTM 390 Adventure.